The marble memorial lighthouse perched on a man-made piece of land on Detroit's Belle Isle Park is unique among lighthouses in Michigan and across the nation. I last visited this lighthouse on a quiet weekday during the early spring. We were able to park within sight of the lighthouse, but I estimated the walk back to the tower at almost a half mile. The lighthouse makes a great photo subject, although shooting through the fence surrounding the tower presented some challenges. I was happy to see a couple of park workers headed out to the tower at the same time I walked out there, and hoped they would let me in behind the fence to take a few photos while I was there. Unfortunately, their gate key didn't work! If you look closely at above photo, you'll see one worker (who climbed the fence to find his key to the door also didn't work) calling someone on his cell phone while his coworker remains locked out of the yard. Meanwhile, I just stuck my camera lens through the fence and continued to shoot photos of the light tower. 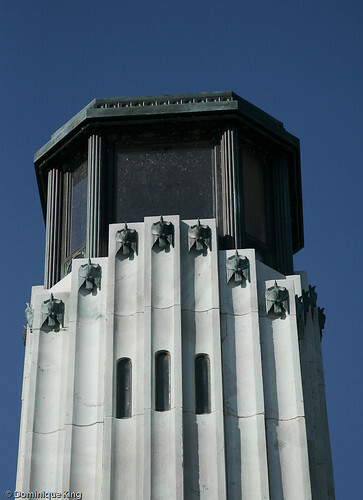 The tower, designed in an Art Deco/Art Moderne style by famed architect Albert Kahn, is the only lighthouse tower in the United States made entirely of marble. 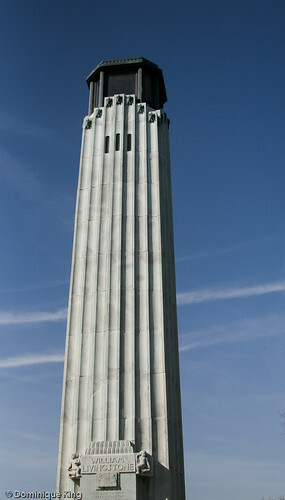 The fluted tower of white Georgia marble sits on an octagonal base and stands 58 feet tall. A bronze lantern room topping the tower brings the lighthouse's total height to about 80 feet and houses an 11,500 candlepower light visible up to 15 miles away on Lake St. Clair. Most people best know Albert Kahn for his many industrial buildings and structures around Detroit, but he also designed other types of structures like several buildings on the University of Michigan campus in Ann Arbor, Michigan, and the Belle Isle Aquarium. The Livingstone Memorial may be his only lighthouse, as I was unable to find any other lighthouses designed by Kahn. 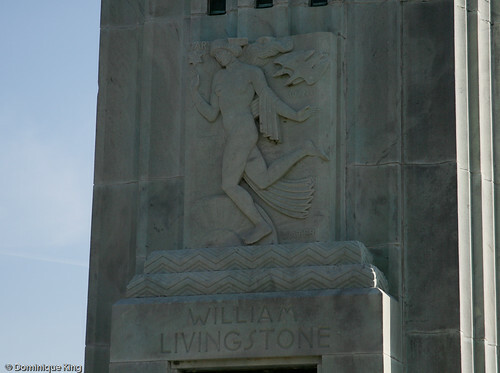 The William Livingstone Memorial Light, honoring the man responsible for shepherding many navigational improvements benefiting the Great Lakes as commercial shipping rapidly grew and changed during the early 20th century, is also unique in being one of only several such memorials in Michigan. Midwest Guest readers may remember my story about the Manning Memorial Lighthouse in Empire, Michigan. 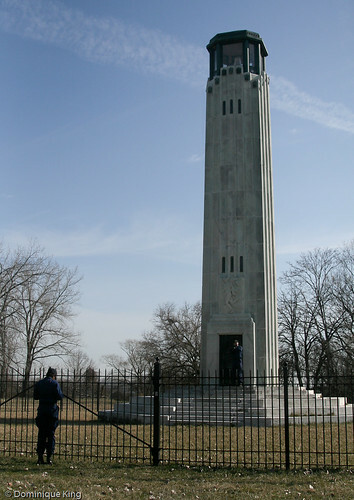 Michigan's third memorial lighthouse is the tower at the Tricentennial State Park, which is on the Detroit River not far from the Livingstone Memorial Lighthouse. Livingstone helmed the Lake Carriers Association, a group of those owning large Great Lakes ships, as president from 1902 until his 1925 death. Livingstone presided over many developments and improvements bringing Great Lakes shipping and navigation into the modern era. 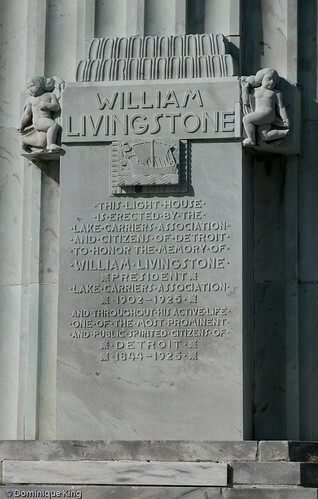 The Coast Guard recognized Livingstone's role in developing clearly marked channels from ships traveling the Detroit River between Lake Erie and Lake St. Clair by naming the channels for him. 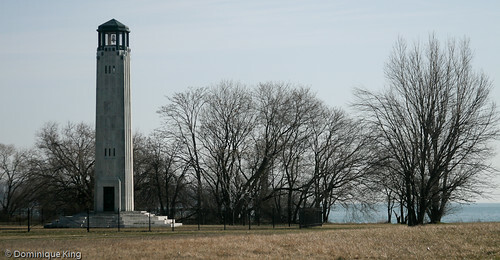 The Lake Carriers, and Livingstone's friends and family, decided to honor his contributions to Great Lakes navigation by building the lighthouse on the Detroit River. Kahn received the commission to design the tower, and Livingstone's admirers raised the money needed to build the lighthouse. The project cost $100,000 and included extending the eastern tip of the island out about a quarter mile into the river. The lighthouse was built in 1929 and dedicated in 1930, which seems pretty amazing to me when you consider the cost of the project and the fact that the timing coincided with the big stock market crash and dawn of The Great Depression. Check out Where I live: Detroit's Dossin Great Lakes Museum celebrates 50th anniversary and Great Lakes maritime lore lives on at Detroit's Dossin Great Lakes Museum here at Midwest Guest to learn more about Great Lakes maritime history in the Detroit area and Belle Isle's Dossin Museum. Want to learn more about Belle Isle and its history? You might like reading Detroit's Belle Isle: Island Park Gem by Michael Rodriquez and Thomas Featherstone. I also understand this particular lighthouse is the only one in the U.S. built in the Art Deco/Moderne style. A real treasure. This is my favorite area of the park. It's so peaceful on the river by the light tower or back along the lagoon. If you can't find me at work or home, I'm probably there with a book relaxing. Thanks for the article! Charlie-I suspect you are correct. I've never seen another lighthouse like this one, and there aren't a lot of them built in during that time period that I know about. It really is a beautiful structure, though. David-Thanks for stopping by! I can imagine this would be a great place to get away from the weekend crowds. We were out there during the week when I took these photos and a few that I've used in other blog entries. This Lighthouse was designed and built by ARCHITECT - Louis Kamper. Not Albert Khan. Thanks for stopping by, Luke. The only site I found that connected Louis Kamper to the lighthouse was the Find-a-grave site (which did not reveal the source for their attribution). I found numerous sources crediting Kahn and/or his firm with designing the lighthouse, including: documents related to the lighthouse in the Albert Kahn collection at the University of Michigan's Bentley Historical Library http://quod.lib.umich.edu/cgi/f/findaid/findaid-idx?c=bhlead;idno=umich-bhl-0420;view=reslist;didno=umich-bhl-0420;subview=standard;focusrgn=C02;cc=bhlead;byte=63077297 , the Detroit Area Art Deco Society page crediting Kahn with the design http://www.daads.org/full.php?subaction=showfull&id=1274890479&archive=&start_from=&ucat=5& and my copy of The American Institute of Architects Guide to Detroit Architecture by Hill and Gallagher that credits the conservatory, aquarium, and the Livingstone Light House on Belle Isle all to Kahn (listings 292-294, pp 262-4). I'm familiar with several buildings of Kamper and Kahn, and the style of the lighthouse seems more in line with Kahn's style. I also remember reading that Kahn designed the now-gone Livingstone house in Detroit's Brush Park. It was supposedly Kahn's first commission. So, I have to stand by the information that the lighthouse was a Kahn project...unless I find compelling evidence to the contrary. I do enjoy seeing Kamper's work around town, too. I was pleased to see that they appear to have done a little bit of rehab work on the Kamper-designed mausoleum in the Roseland Park cemetery at 12 Mile and Woodward in Berkley, Michigan. Oh, I've visited this lighthouse so many times. So close to home and a real treasure. I do believe the last time I was here, the snow was up to my knees, and it took all I had to walk to it. A fantastic post! Thanks. It really is a unique lighthouse, isn't it? A lot of folks are surprised to find that Detroit has a lighthouse...let alone more than one! Hi--the figures look like the work of Rockwell Kent, who was friends with Kahn's nephew. Do you know who is responsible for them? I visit this lighthouse once every few years, as it is a beautiful place, and also where I proposed to my wife over 30 years ago. Still happily married!